In the exterior remarkable gargoyles and corbel figures have survived from the time of the building’s construction, but the only medieval portal is the St Peter Portal on the west side of the south tower. It has figures of exceptional quality on the jambs and archivolts, some of which have been attributed to Heinrich von Gmünd. Slightly earlier figures and fragments of baldacchini and gables have survived on the south tower. In the 19th century all nine portals were furnished with sculpture. Some of those destroyed in World War II were replaced c.1955. Inside the cathedral are stone figures on the choir piers representing Christ, theVirgin and the twelve Apostles. They are around 2 m high and stand under baldacchini about 5 m from the floor. Except for those of Christ and the Virgin, the baldacchini are surmounted by music-making angels. The figures were made in the cathedral workshop, and the style follows the latest French models, especially that found at the Sainte-Chapelle, Paris. The richly patterned drapery was renewed in the 19th century, based on the medieval remains. The Cologne cathedral choir contains an exceptionally well-preserved collection of medieval furnishings. 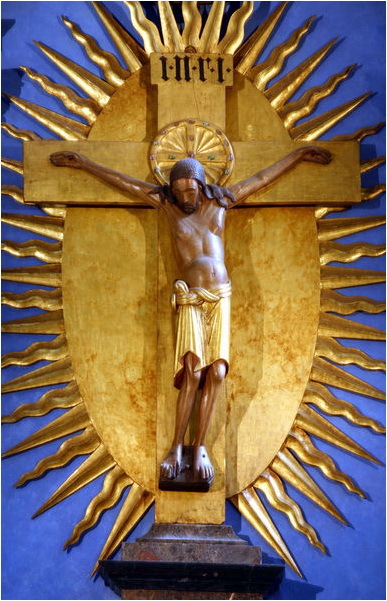 The huge Gero Crucifix made of oak in the Kreuzkapelle, brought from the old cathedral, is the earliest extant life-size statue since antiquity and was the model for numerous medieval crucifixes. The oak choir-stalls made between 1308 and 1311 have 104 seats and are the work of both the cathedral workshop and a Paris workshop. Some stylistic influence from Lorraine is also perceptible, and this is even more marked in the contemporary marble figures of saints on the high altar, made by Lotharingian sculptors working with craftsmen from Cologne and Paris. Despite employing specialist sculptors for the choir-stalls and high altar, however, the cathedral workshop was still able to develop a style of its own that left its mark on sculpture in Cologne until beyond the middle of the 14th century. Some of the original medieval furnishings of the choir were destroyed in the 18th century and rediscovered in excavations; these include fragments of sculpture from the choir portals, stone celebrant’s chair and reading platform. Like the architecture of the choir screen they were painted in brilliant azurite, vermilion and gold. The Late Gothic tabernacle, probably made by the sculptor Franz Maidburg, was also demolished in the 18th century; two reliefs are preserved in the Schnütgen-Museum, Cologne. Many medieval sculptures survive in the choir ambulatory and chapels. The workshop that produced the choir-pier figures also made the Virgin of Milan, which replaced a figure of the Virgin brought from Milan by Archbishop Rainald von Dassel together with the bones of the Three Kings, for which the great shrine was made. The chapels also contain the tombs of many of the Archbishops of Cologne. Each is related to an altar, and their arrangement is indicative of the political iconography of the cathedral choir. The bronze tomb of the cathedral’s founder, Konrad von Hochstaden, which originally stood in the axial chapel, is the earliest monument from the Gothic cathedral. It must have been made shortly after the death of the archbishop, and reflects the style of the transept portals of Notre-Dame, Paris.